So tell the Brainiacs a little about the Crossover Kidz how’d you two get started? When I (MuZ) first moved to Boston in summer of 2010, I wasn’t even rapping, I had quite a few months before to really focus on songwriting in general. But because of some persuasive talk from a couple close friends I kind of started doing it again. When Droobee came to Boston in the fall, he started looking for the dopest rappers. I’m not the best rapper, but I will be, and I think Droobee saw that in me. And I saw a great opportunity to have a great producer even though my brother, Sick already was producing my work. (We keep in the loop to. Co-producing a lot of songs and producing my next solo project with Droobee). After making our first couple songs we just came up with the name. It just stuck. Droobee what was it about MuZ that made you want to work with him? Mann, I moved up here to Boston ready to good hip-hop. When I met MuZ, I was diggin’ his style (no homo), then I heard him spit, and his lyrics and flow were on point. I was so down to start working with him, and it all worked out. Who would you say you guys are most heavily influenced by? What was the very first song you ever did together? “All The Things”…. besides the unreleased tracks we first worked on that the world will never hear. You guys are from completely different regions (Kansas and Texas) would you say your styles are complimentary? Why? Though I (MuZ) was born in Kansas I spent my hip hop years in Florida. Being a student is a demanding task on its own, the additional responsibilities of being artists makes things more difficult how do you find a balance? [Droobee] We try. Of course, if we have to make a decision between the two, the music comes first. [MuZ] Honestly my grades have definitely gone down, but life is too short to not try to accomplish everything you want. The music industry has changed its geared more towards artists going indie. What do you guys think of this? [Droobee] We’re down for that! [MuZ] Just plan on using that to our advantage in every single way possible. With things like napster (in its early days) Youtube, Myspace etc, do you think that the internet has been a help to the music industry or a hindrance? Why? Both. The Internet creates a place where everyone can hear your music, and then download it illegally. However, I think when this whole situation sorts itself out, the industry will grow into something greater than before. 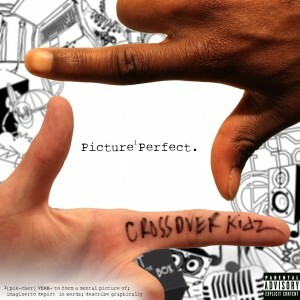 What was your state of mind when making “Picture Perfect” what was the goal you had when going through the process?? We had put out several tracks before, but we really just wanted people to hear our true potential (at that moment…it’s always increasing). So I guess our mindset was to just create songs that we enjoyed, and that could relate to our everyday lives. Are you guys working on another project currently? Yes, a few. MuZ is currently doing a solo project with several tracks produced by his brother and some produced by me (Droobee). I’m also thinking about starting a solo production with many different features over my beats, but nothing is for sure. Other than those things, we just want our artistry and music to progress so we can take on the next Crossover Kidz project when we’re ready. What can we expect in the future from Crossover Kidz? Better music, better music and better music. We want to keep growing. I think Droobee’s sister asked us how we describe our music in short words. I told her, “Constant evolution”. We want to say thanks to all the people who really support, and a shout out to AJMG, Sonny Shotz [Of the Dean’s List], Jordan Brown, Sick, Taylor Made, and a slew of people of helped out with our mixtape! Keep supporting and we’ll keep supplying the ear crack.